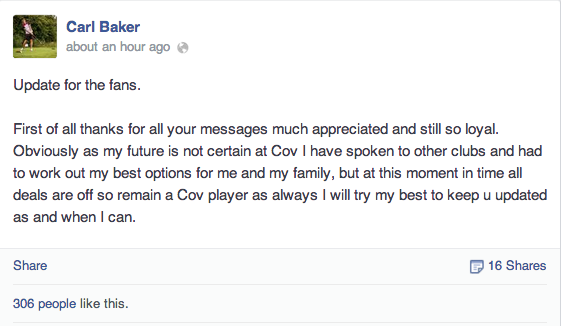 Former Coventry City captain Carl Baker has confirmed that at the moment, “all deals are off” and he remains a Coventry City player. The 31-year old has been linked with both Leyton Orient and Barnsley after having the captaincy taken off him and handed to new summer signing Reda Johnson. It was reported that Baker was in the stands to watch Barnsley’s 1-1 with Hull City on Saturday however Baker seems to be seeing out the final year on his contract with the Sky Blues. In 182 appearances since signing for £300,000 from Stockport County in January 2010, Baker has scored 28 goals but is believed to be one of the highest earner’s on City books. Manager Steven Pressley is believed to have told Baker he is surplus to requirements following the additions of Mohammed Coulibaly, Jim O’Brien and Danny Swanson over the summer. « Tudgay signs one-year contract.